Rugrats is a cartoon show which aired on Nickelodeon back in August of 1991 up until its original run which lasted until June 2004. Rugrats is a wonderful show that takes you into the lives of several young toddlers who have just been born who experience different day to day experiences. The show takes you into what they do every single day and what it is that they think the adults in their family do. It is mostly common for them to misinterpret what the adults in their family seem to say. The show Rugrats has a few main characters that always have big parts in each episode. They are Tommy, Phil and Lil, Dil, Chuckie, Angelica, Susie, and Kimi. These are the characters of the show, and they take you on a wide range of daily activities that they, in their minds, believe is an adventure. This could be simply walking up the stairs or staying in a closet; they always look at things to be so different compared to what adults see and experience. Tommy Pickles is the toddler who is the main star of the show. He is usually the person who usually knows what is always going on with his life. He is oftentimes considered the leader of the group because of his ability to think when needed. He has a cute younger brother named Dil who is always there being the baby of his family. Tommy's sidekick Chuckie always seems to be the slightly slow one of the group since he believes everything. Phil and Lil are the twins who always wear the same clothes and are also a bit slow at times. Angelica is Tommy's older cousin, also known as the bad girl or the mean one in the family. Kimi is Chuckie's cousin who is later on introduced to the show while Susie is Angelica's friend that is more kindhearted than Angelica. Rugrats is a show that all children need to watch. The premise and the concept of the show takes children on exciting adventures and different life experiences. Having earned big awards, this show is a must to watch for your kids. Tommy temporarily loses his nerve after slipping on a playground apparatus, and Angelica challenges the babies to tests of valor to see who's the "braveliest"./Didi takes the babies to college to be part of her Child Development experiment. They escape and have an adventure on the campus. When the babies accompany their mothers to Krudnik's annual half-off baby sale, the Rugrats think that they are being sold./The babies build a snowbaby and name him Steve. After he melts in the sun, they realize that change is just part of getting older, and they throw a party for Steve the waterbaby. Stu, Chas, Angelica, and Susie enter Spiffy, Puppy, Fluffy, and Herbie the gerbil, respectively, in a pet show, all vying for "Best Pet" honor./Taffy takes the babies to their first fast food restaurant and orders her burger without pickles, because she "hates dill pickles." Overhearing, the babies try to make Dil sweeter, so she will like him again. The Finster's puppy is lethargic, and the babies believe it's because she hasn't been properly named yet. Kira calls upon eccentric pet psychologist Dr. Mutterly to diagnose the problem./Betty's college roommate comes to visit with her daughter Alice, just as weather reports forecast a hurricane, also called Alice. When baby Alice "turns the house upside down," the babies mistake her for a storm. Action star Mack Granite picks Kimi to audition for a part in his next movie, saying she's going to be a star. The babies think that she is going to live in the sky./When Taffy comes to baby-sit, but is in an artistic funk, and Angelica enters dressed (and acting) like Taffy, the babies believe that they've swapped identities. Taffy takes the babies to their first high school basketball game, and they set out to defeat the visiting team's mascot - a giant bug. / Angelica convinces the babies that the Pickles' crawl space is their new play area so that she can have the living room to herself. It's puppy adoption day at the Pickles house, and all the puppies have been adopted but two: Spiffy a very playful puppy, and Puppy who is "scaredy". Chuckie decides to teach Puppy to be brave./Grandpa Lou takes the babies to an exotic pet shop. Angelica, jealous of the ring Grandpa Lou gave to Lil as a present, tries to steal it, prompting the babies to go on an Indiana Jones type adventure. The babies try and make Dil take his first steps so he can play a game with them. As they prop him up, Stu mistakenly thinks he sees Dil walking, prompting reminiscences about each of the Rugrats' first steps. / Charlotte sets a play date for Angelica with bumbling pre-school classmate Harold. Taking a cue from her hyper-exec mother, Angelica casts Harold as her "assistant" for the day. To celebrate Boris and Minka's anniversary, the whole gang takes a train trip to Little Biendeltown, a theme-park re-creation of the Old Country. In a send-up of Agatha Christie-style mysteries, the scenic 18-hour journey is characterized by strange occurrences, shadowy figures, and crime -Minka's necklace is missing and, even more heinous, someone's pilfered Chuckie's stuffed bear Wawa! Chas and Kira take on a work-study teen to help around the coffee shop. "Cyndy" is such a dead ringer for Angelica's Cynthia doll that the babies are convinced the doll's come alive. /In order to impress some four-year old girls with a "thing" for babies, Angelica promises to be nice to the Rugrats forever if Phil will stop making mudpies with them and go play house with the older girls. When the mommies leave the babies with their fathers, all hell breaks loose at home, ending up with the babies trashing the house and the dads getting locked inside Stu's latest invention, a fully-automated, state-of-the-art playpen./Angelica tells the babies that the reason her new doll is so realistic is because it's actually a real baby that was turned into a doll. Rugrats is currently available to watch and stream on Nickelodeon. 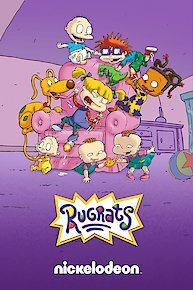 You can also buy, rent Rugrats on demand at Amazon Prime, Amazon, Hulu, Vudu, Sling, Google Play, DIRECTV NOW, iTunes online.